Ald. Peter Braithwaite (2nd) at a city meeting. Aldermen on Monday discussed the possible cuts to the Department of Health and Human Services. A number of proposed cuts to the Department of Health and Human Services may be restored, following budget discussions during Monday’s City Council meeting. Aldermen had expressed their concerns about the potential department cuts and restructuring, which are meant to help fill the city’s projected $7.4 million deficit for fiscal year 2019. Included in the original proposal was a cut of the department’s communicable disease specialist, its assistant director and a community health educator. However, Illinois state law requires the position to be filled for the department to be recognized and receive federal and state funding. The specialist collaborates with medical providers and residents to investigate reports of infectious diseases and alert the city’s health department. They also partner with healthcare and public health agencies to control infectious disease outbreaks. Health care providers, staff and aldermen have spoken out against the proposed cut, and at a Saturday City Council meeting, city manager Wally Bobkiewicz also urged aldermen to vote against the original draft proposal. 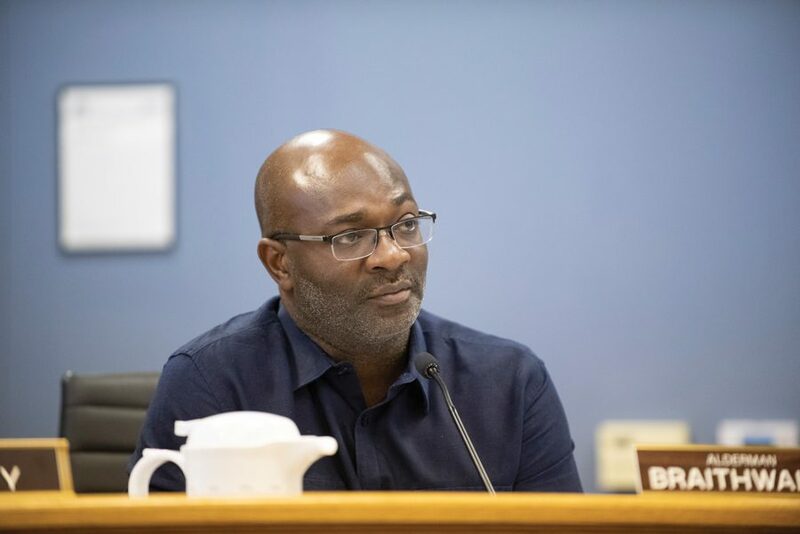 He echoed this sentiment at Monday’s meeting, saying the positions the city had considered for elimination were all funded by grant money rather than the general fund. Health and Human Services Director Evonda Thomas-Smith said the question of classification is contingent upon a few factors. First, there are a number of mandated services the department has to administer by law — including food safety, infectious disease prevention, potable water and private sewage. If the communicable disease surveillance specialist were to be eliminated, the department’s local classification would be at risk. Additionally, Thomas-Smith said, the department is required to do a community-wide health assessment and community programming which allows it benefit from state money. The state certification also gets the department a number of grants and access to resources, and is contingent upon it having a community health educator. Evanston is one of four state-certified health departments in Illinois, outside of the city of Chicago. It has been state certified from 2016 to 2021, and Thomas-Smith said the re-certification process would most likely start in 2019. Thomas-Smith said she is unsure what would happen to Evanston’s state grants if the department were to be un-certified, Nirav Shah, the Director of the Illinois Department of Public Health, told her he had never un-certified a department in the state before. Funding from the certification and Community Development Block Grants totals $800,000 for fiscal year 2019. The $388,000 of CDBG funding is not tied to the certification, Thomas-Smith said. Ald. Peter Braithwaite (2nd) said he was also concerned about the possible cuts in funding. He advocated for aldermen to vote to also keep the assistant director and community health educator positions in the department. His motion ultimately failed 5-4.